Coming off the three-day-weekend (and a couple of movie marathons for our membership,) the Brattle Theatre keeps programming on track, preparing local audiences for this week’s new Wes Anderson release, MOONRISE KINGDOM. 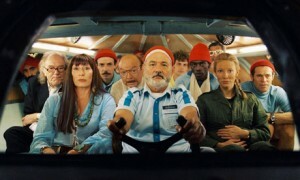 First up is possibly one of Anderson’s most overlooked films, THE LIFE AQUATIC WITH STEVE ZISSOU. I’m glad they’re starting off with this oddity, if only because it deserves a second glance. Still the critically lowest-graded film Anderson has made (53% on Rotten Tomatoes), THE LIFE AQUATIC should be seen as more of a fantasy film with a dramatic touch. Cruising the seven seas is a breeze for an expert like Steve Zissou (Bill Murray), a figure loosely based on the real life explorer, Jacques-Yves Cousteau. Tragedy strikes during the filming of one of his renowned documentaries, and his best friend is killed by a species of shark that supposedly no longer exists. Zissou sets off with an odd assortment of characters that includes a heavily-accented Willem Dafoe, a pregnant Cate Blanchett, and a long-lost son played by an eager Owen Wilson, to exact revenge on this shark. But as with Anderson’s previous efforts, a great deal of care went into set design, and I’ll be surprised if a better combination of the primary colors can ever be coordinated again with a yellow submarine, sky-blue track suits, and bright red knit hats. Certain colors feel desaturated out, but then there’s small bursts of color on clothing or a fish to break the monotony of drab ship quarters. Some of the craziest combinations belong to the invented fishes, some fitted with an enough of the spectrum to make FINDING NEMO’s inhabitants jealous. Zissou’s nemesis, Alistair Hennessey (Jeff Goldblum) is appropriately fitted in Cold War modern gear, usually donning white suits or robes on his grey ship. The color around Hennessey’s ship look just as bleak, the ocean blue no longer as bright. For Hennessey sees and experiences the ocean differently than Zissou, often missing its natural beauty just outside of the ship’s hull. This entry was posted in Repertory Picks and tagged Brattle Theatre, Life Aquatic with Steve Zissou, Wes Anderson by bofca. Bookmark the permalink.